Imagine a big red barn. Fill it with rainbows of color, panoplies of texture, and wall-to-wall creative displays. 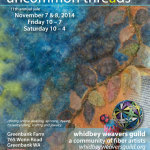 This is the Whidbey Weavers Guild 11th annual Uncommon Threads Sale! The event is held at Greenbank Farm’s Red Barn from 10 a.m. to 7 p.m. on Friday Nov. 7 and from 10 a.m. to 4 p.m. on Saturday Nov. 8. The Uncommon Threads Sale represents hundreds of hours of work throughout the year by Guild members, both in the sale’s organization as well as the loving creation of beautiful hand-crafted products. This is a great opportunity to do some early holiday shopping and purchase unique gifts for friends and family. A wide range of pricing ensures something special for every budget. The sale attracts fiber arts enthusiasts from all over Whidbey as well as off-island. The handmade items for sale are woven, knitted, crocheted, felted and spun. Fiber arts of all kinds are represented, offering hand-spun yarns, dyed spinning fibers, rugs, braided or felted jewelry, baskets, clothing and housewares. You will also find hand-painted silk scarves, Japanese temari balls, cards and felted soaps. In keeping with the Guild’s mission of outreach to the community, there will be demonstrations of kumihimo (a Japanese braiding technique), weaving and spinning. Come and see these folks in action! These artists, as well as many others, will be available throughout the sale to answer questions, provide information about their craft and offer advice. WWG meetings are open to the public and are held on the first Thursday of the month from 10 a.m. to 2 p.m. at the Pacific Northwest Art School, 15 NW Birch St., Coupeville. Renowned fiber artists from around the world provide presentations and workshops throughout the year. Additionally the Guild offers educational outreach events in the community, and has a variety of study groups where participants focus on a particular area of fiber art, perfecting their skills and learning from each other. The Guild is dedicated to keeping fiber arts alive and well in our community, for today and for generations to come. To learn more about what the Whidbey Weavers Guild has to offer, please go to the website at www.WhidbeyWeaversGuild.org.